​A historic district is a group of buildings, properties, objects or sites that physically and spatially comprise a specific environment. Districts are made up of a significant concentration of properties that share common elements that are related to each other and unify the area. ​The first historic district in the nation was established in Charleston, South Carolina, in 1931. The first, the Wild Rose Tract Historic District, was created by the Monrovia City Council in February, 2008, and officially dedicated on March 17, 2009. 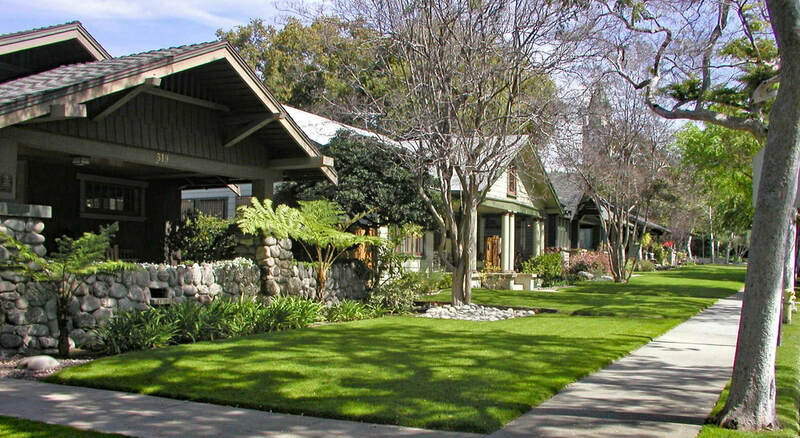 It lies in the 300 block of Wildrose Avenue, between Canyon Boulevard and California Avenue. There are 18 properties within the district, of which 15 are deemed contributors (A contributor in a historic district is defined as one that adds to the historical integrity or architectural qualities that make a historic district listed significant). ​Shown below are the contributors to the Wild Rose Tract Historic District. The second, the North Encinitas Historic District, was created by the Monrovia City Council on April 4, 2017, and officially dedicated on July 27, 2017. It lies in the 100 and 200 blocks of North Encinitas between Foothill Boulevard and Greystone Avenue. Of the 64 properties within the district, 38 are listed as contributors. ​Shown below are the contributors to the North Encinitas Historic District.